Favorite Bows: You will often see Lemmon wearing these or these. They are the only bows that stay on her head with all that thick hair 😉 She doesn’t pull them down and I love that they don’t leave an imprint in her head. Plus, they are always coming out with new designs! Shampoo/Conditioner: We have been using these products for a while now and just got their whole kid styling line. We LOVE them! I’ve noticed such a difference in Lemmon’s curls and washing her hair has become not such a crying fit haha. Favorite Vest: Lemmon calls this her “Suave” (soft) and reaches it for it every morning. We have about 3 of these and then 2 more fur coats. She loves them and they keep their fluff even after every wash. What I love most is that she is still wearing the one she got from her baby shower that is a 6-9 month vest! They tend to run big so they last a while. House Slippers: We have hardwood floors and I knew once the winter months were approaching that The Squeeze would need something to keep her little toes warm. She loves to put these on herself since they are so easy to slip on and off. They are lined with fur and keep her feet nice and warm. I’ve even washed them a few times (she ran outside into dog poop one time! ugh!) And they look (and smell haha) like they did when I bought them. Bottle: Since I never nursed Lemmon I knew we needed to invest in good bottles. I got some recommendations from other mama’s and Lemmon seemed to love these the best. She’s never had an stomach issues or problems drinking from them. We’ve had the same ones since she was a newborn and LOVE them! They are small and fit the right amount of formula/milk in them. Best Blanket: We got TONS of questions on Lemmon’s blankets. She only has these Minky’s and won’t go for any other blankets (we’ve actually gave away all her non-minky’s haha) They are hands down the softest blankets you will ever touch. This one particular is Lemmon’s favorite. I don’t know if it’s the size or the print or whatever, but she is obsessed and also calls it her “Suave” I know it’s an investment but they always have some sale or discount code going on. So keep your eyes peeled! Princess Jeep: Lemmonade got this for her first birthday and rides it everywhere. Inside, outside, will watch her shoes on it, do tricks on it haha she loves it! It’s just a fun, entertaining toy for her. Best Lotion: We knew Lemmon would be prone to eczema so we needed something strong but with zero scent and not to thick. This lotion is so smooth! We’ve been using it for almost a year now and she hasn’t had one eczema breakout! Before that she would get them monthly. I love it because a little goes a long way! Favorite Snack: These are perfect to throw in your diaper bag/purse when you know you wont be able to stop for any food or are in a hurry. 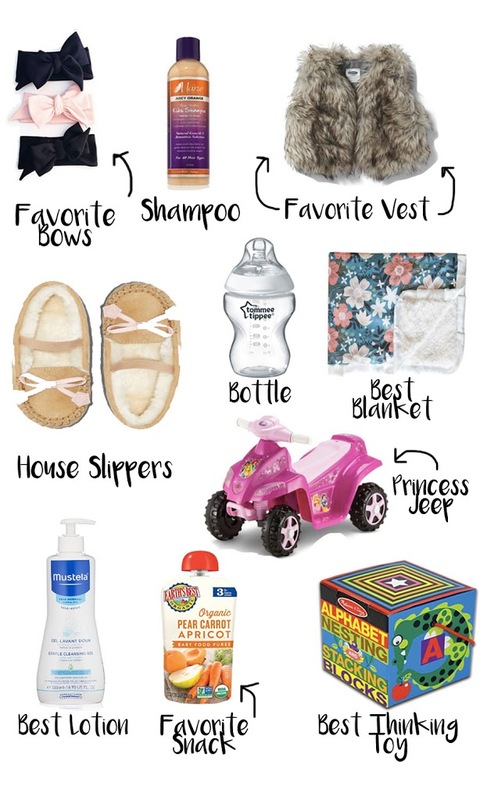 We used these on our road trip actually and it saved us time from stoping every couple hours to feed her. She has loved this brand from day one and has never turned down a flavor. Best Thinking Toy: So, we didn’t get this till the end of the year but a friend of ours gave this to Lemmon as a gift and she is obsessed! She could sit there forever putting these boxes together. It’s basically a big box with tons of smaller boxes inside of it. They also have the alphabet on the outside for when they are older. Lemmon loves stacking things and putting things inside each other. So this toy is perfect for that! She does get frustrated because she’s putting the wrong box inside another box but it’s amazing to see her little mind work to figure it out. Plus, it’s helping her to use her words to ask for help! We ended up buying a few more toys similar to this one. "Where To Start With Adoption"